TLDR; As previously announced and directly communicated to developers via email, we'll be removing apps from the Google Play Store that ask for SMS or Call Log permission. If you have not submitted a permissions declaration form and your app is removed, see below for next steps. This entry was posted in Android Developers Blog and tagged Android, Call Log, Google Play, Policy, SMS on January 15, 2019 by Android Developers. Every interaction a user has with your app matters. That’s why we’re constantly evolving our advertising recommendations and policies to ensure that no matter where and on what device users are engaging with your apps, they have good experiences. With the launch of the iPhone X, app developers now need to plan for new design considerations as the rounded corners, notch, and home screen indicator on the extended screen can obscure content and lead to poor ad experiences for users when ads are placed in these areas. That’s why we’ve put together a guide to help you adapt your ad strategy for iPhone X. This includes guidance for how you can shift placement of banner or native ads to designated “safe areas” for this new device. We’ve also updated our policies to indicate that ads must not be placed where objects may interfere with the user's typical interaction with the ad or app, such as under the home screen indicator on the iPhone X. Please review these policy updates and our suggested implementation guide to ensure you’re compliant by November 20th. If you have any questions, visit the AdMob Help Center or contact your Google account team. This entry was posted in AdMob Blog and tagged AdMob, App Best Practices, Policy, Product Announcement, UX on October 23, 2017 by Madison Addison. This entry was posted in Inside AdSense and tagged AdSense, Policy, Pop-Unders, Pop-Ups on July 11, 2017 by Chris Jones. As a publisher you face many challenges. One of the broadest and most encompassing of these is growing your user base while making sure your content remains high-quality and policy compliant. Your feedback has helped us understand this challenge, and we’re always working to improve. A few weeks ago, we announced two new AdSense features: page-level enforcements and a new Policy center. Today, we’re excited let you know that these features are available globally for all AdSense publishers. To allow more precise enforcements, and provide you with feedback about policy issues as we identify them, we’re introducing page-level enforcements. A page-level enforcement affects individual pages where violations of the AdSense Program Policies are found. As a result, ad serving is restricted or disabled on those pages. Ads will continue to serve where no policy violations have been found, either at the page- or site-level. When a new policy violation on one of your pages is identified, you’ll receive an email notification and ad serving will be restricted on that page. As this is a new feature, you may already have current page-level enforcements that were not surfaced through these email notifications. To make sure you’re not missing anything, head over to the new Policy center to review existing violations. After you've addressed all policy violations on a page, you may request a review (previously known as an “appeal”). Reviews typically take one week but can sometimes take longer. We'll restore ad serving on the affected page or pages if a page is reviewed at your request and no policy violations are found. Alternatively, you can simply remove the AdSense ad code from that page and the page-level enforcement will disappear from the Policy center in about a week. In the left navigation panel, click Settings, then click Policy center. In the "Page-level enforcements" section, find the site or sites that have page-level violations and click Show details. In the "Page" section, click the Down arrow to learn more about the enforcement, the violation(s) on the page, and how to fix them. Click Request review and tick the box after you’ve made sure the violations on the page are fixed. Our beta participants provided a lot of great feedback and suggestions on how to make the AdSense Policy center as useful as possible. We’re constantly looking to improve the clarity with which we communicate our policies and policy enforcements, so let us know what you think through the ”Send feedback” link in the AdSense menu. Learn more about these updates in the AdSense Help Center or head over to the Policy center to try it out. This entry was posted in Inside AdSense and tagged AdSense, Beta, Page-Level, Policy on May 31, 2017 by Chris Jones. In this post, we’re going to discuss an easy way to help avoid violating our policy against interstitial ads that unexpectedly launch (Layout Encourages Accidental Clicks - Unexpected Launch Interstitials): implementing a splash page (Loading/Title Screen) in your app. A splash page is a static screen, containing no clickable content, which launches before the user gets to the ‘Home Screen’ of your app. Fig.1: This interstitial ad implementation violates our policies, as an interstitial launches on the ‘Home Screen’ of the app without any action by the user. Fig.2: This implementation does not violation policy. The first screen the user sees is a splash page, followed by an interstitial. Then, when the user closes the interstitial, they are shown the ‘Home Screen’ of the app. Now that the user sees that content is loading, they won’t be encouraged to accidentally click on the interstitial ad once it launches. Then, when the user closes the ad, they are shown the ‘Home Screen’ of the app. NOTE: When the user closes the interstitial ad, they must be shown a new screen. Interstitial ads are only to be implemented at logical breaks in between your app's content, so you can’t have the splash page still be there when the user closes the ad. That would be a policy violation. To have the interstitial ad trigger at the right time, you may need to preload it. You can find more information about preloading interstitials here. As mentioned, as the developer of your app, the design of your splash page is up to you. The only requirement is that the screen doesn’t contain any elements that might encourage users to accidentally click on the interstitial ad once it launches. It is important to note that, as a developer, it is your responsibility to ensure compliance with our policies. You can consult our Help Centre for even more helpful information regarding our policies and best practices. This entry was posted in AdMob Blog and tagged AdMob, interstitial ads, interstitials, Policy, Splash Pages on April 4, 2017 by Chris Jones. In today's post, we'll be discussing AdMob account suspensions due to invalid traffic. We have found that there are two types of publishers who may have invalid traffic issues with their accounts. The first are publishers who may unintentionally send invalid traffic to their accounts, typically by testing on live ads. For those, we hope that increased transparency into our policies and processes can decrease these unintentional violations and help our publishers play by the rules. The second are publishers who intentionally bypass our rules, ending up with a variety of invalid traffic issues in order to artificially inflate their ad revenue. That’s why we work hard to maintain a policy compliant ecosystem for our publishers, advertisers, and users. In short, if you play by the rules, AdMob is here to help you grow your business. We receive many questions about account suspensions, so let's go through the top questions about this process and steps you can take to help keep your account in good standing. What is invalid traffic anyway? Invalid traffic includes any clicks or impressions that may artificially inflate an advertiser's costs or a publisher's earnings. Invalid traffic covers both intentionally fraudulent traffic as well as accidental clicks. Please note that clicks on Google ads must result from genuine user interest, and any method that artificially generates clicks or impressions is strictly prohibited by our program policies. If we observe high levels of invalid traffic on your account, we may suspend or disable the account to protect our advertisers and users. If your account was suspended due to invalid traffic, ad serving has been turned off on all of your content for a fixed period (most frequently 30 days). This includes any website, YouTube channel, and/or mobile app. Please know that we will deduct revenue from your account and will credit advertisers with the withheld revenue where appropriate and possible. If there are no further compliance issues with your account, it will be automatically re-enabled after the fixed period. Please note that your account is still active, and an account suspension is not the same as having your account disabled. If your account was disabled due to invalid traffic, your account is no longer serving ads, and you will be unable to monetize with any Google ad solutions. As with account suspensions, please know that we will deduct revenue from your account and will credit advertisers with the withheld revenue where appropriate and possible. Visit our Help Center for more information about suspended accounts or disabled accounts due to invalid traffic. Why did my account get suspended? In addition to monitoring for policy violations, we analyze all clicks and impressions to determine whether they might artificially drive up an advertiser's costs or a publisher's earnings. If we determine that your account has invalid traffic, then we may suspend or disable your account. Please know that we may deduct revenue from your account and may credit advertisers for the invalid traffic we detect. Clicking ads on your own app: Publishers may not click their own ads or use any means to inflate impressions and/or clicks artificially, including manual methods. Testing your own ads by clicking on them is not allowed. For AdMob ad placements, please use test ads (available for Android, iOS) to avoid generating invalid traffic. One or more users repeatedly clicking your ads: Don't encourage or ask your friends, family, co-workers, or general users to click on your ads. This includes asking for users to support your app, offering rewards to users for clicking ads, and promising to raise money for third parties for such behavior. We recommend that you check your associated AdMob email for more information regarding your account suspension. What steps should I take during the suspension period? Account suspension gives you time to investigate the sources of invalid traffic, identify and block suspicious traffic, and put measures in place to ensure clean traffic. We recommend using Firebase Analytics to help you best understand, monitor, and evaluate the traffic to your app. This may also help you identify sources of invalid traffic. Visit our Help Center for more information about suspended accounts due to invalid traffic. How can I appeal an account suspension? Account suspensions are currently not appealable. You can use this time to investigate your traffic sources and make adjustments to help prevent invalid traffic in the future. Provided that there are no further compliance issues with your account, it will automatically be reinstated once your suspension period is served. Please don't fill out the invalid traffic appeal form because that form is reserved for disabled accounts, and you will receive an email that says we can't process this appeal. If you would like to provide additional feedback to help us improve our processes and communications, you may do so using our suspended publisher feedback form. When will my account be re-enabled? If there are no further compliance issues with your account, it will be automatically re-enabled after the fixed period (most frequently 30 days). What happens if after my account was re-enabled, my account continues to generate invalid traffic? If, after your account has been re-enabled, invalid traffic persists and continues to contribute low value traffic to our ads ecosystem, then we may need to disable your account. Visit our Help Center for more information about suspended accounts due to invalid traffic. We look forward to your return to the AdMob network in good standing after the suspension ends. This entry was posted in AdMob Blog and tagged Account Suspensions, AdMob, App Best Practices, Policy, Suspensions on March 3, 2017 by Chris Jones. In today’s topic, we’re exploring how you can help stay compliant with AdMob policies when using the AdMob interstitial ad format. If you have ever received a policy message for “Layout encourages accidental clicks - Interstitial Ads”, or have had trouble with implementing interstitials to trigger on time, read ahead for our best practices. App layouts that encourage accidental clicks are a common policy issue for publishers. 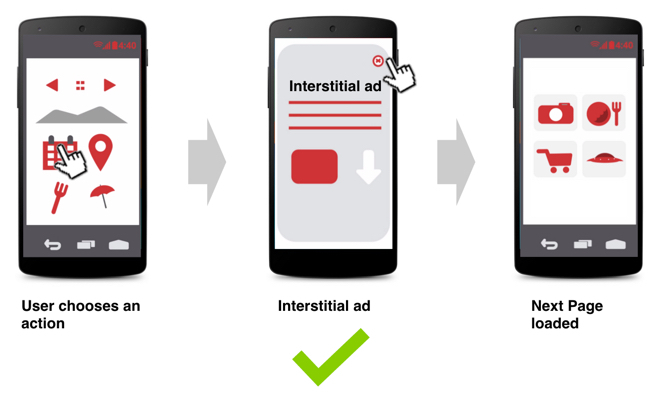 When implementing interstitial ads within a mobile app, there may be a slight delay in when the ad gets triggered after a user selects an action. In the example below we can see that an interstitial ad launches unexpectedly with a delay on the second screen after the page has already loaded. This delay can occur due to carrier latency when requesting the interstitial ad. Pre-loading your interstitial ads will allow you to avoid latency when the ad is displayed to the user. In the corrected example below, the user now clicks on a transitional button and an interstitial ad is shown immediately on action. Once the user closes the interstitial ad they will now be on the next loaded page. 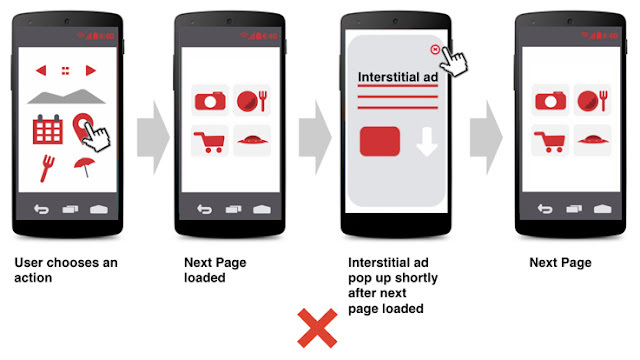 To learn more about how to preload your interstitial ads, please follow the AdMob Interstitial Ad developer guidelines for apps developed for Android and iOS. Implementing these ads in the right way is better for your users, advertisers and for you. AdMob policies are designed to create a positive user experience. For further tips on AdMob Interstitial Ads and Best Practices, check out our official best practices video. This entry was posted in AdMob Blog and tagged AdMob, App Best Practices, interstitial ads, Policy on February 22, 2017 by Chris Jones. In today’s topic, we’re going to discuss a feature of the AdMob front-end interface that you may have overlooked in the past: archiving ad units in your apps. When you archive an ad unit, all ad serving and settings associated with the ad unit will be disabled and active campaigns linked to the ad unit may stop running. You’ll no longer be able to access the ad unit from the monetize tab in the AdMob user interface; however, you can still view historical reporting related to that ad unit. It should be noted that you’ll be unable to reverse this process. Once an ad unit has been archived, it will be archived permanently. It may seem counterintuitive at first. Why archive an ad unit and disable ad serving to your own apps, potentially leaving money on the table? Well, if you're in control of a large portfolio of apps, things aren’t always so simple. Perhaps you no longer have access to your app’s source code, or you have so many apps that it can be difficult to keep track of them all. These “legacy apps” can make it hard to ensure that all of your apps remain compliant. Policy violations that go unfixed can lead to the temporary suspension of your AdMob account. The easiest way to avoid this issue is to archive any ads in your legacy apps. If your apps aren’t showing ads to users or generating revenue, then they likely aren’t violating AdMob policies. You don’t need to make any changes to the source code in your app, as you can take care of everything in the AdMob front end by following the steps below. In the AdMob user interface, navigate to “MONETIZE” in the top bar. You’ll be able to find a list of the apps in your portfolio along the left side of the screen, and clicking on any of them will bring up the app’s ad units. To archive any of these ad units, select the box beside the ad unit, and then click on “ARCHIVE”. Once you’ve archived the ads, they’ll stop generating revenue and users will no longer see them. It is important to remember that this is a permanent solution, and archiving cannot be reversed. This entry was posted in AdMob Blog and tagged AdMob, Archiving Ad Units, Policy on January 12, 2017 by Chris Jones. From time to time, you may encounter Google Play policy issues with your apps. The Google Play policy team has been working hard to provide you with the resources and support you need to resolve policy issues. The policy notification email includes the policy your app violated and the steps you need to take to resolve the issue. If your app is rejected, you can fix the issue and submit the app again for another review - you don’t need to reach out to the policy support team. If you disagree with a policy violation, or if you’d like help resolving your policy issue, you can always contact our support team. Simply use the contact details in the notification email or click on the question mark at the bottom of each page in the Developer Policy Center. For the quickest response, make sure to include your package name. As soon as you submit the form, you’ll receive an automated response with a case number in the subject line. This means your appeal has been submitted successfully. A specialist will review your case and respond to you within 72 hours. If you’d like to learn more about Google Play policy, check out the “10 tips to stay on the right side of Google Play policy” video on the Android Developers YouTube channel or below. This entry was posted in AdMob Blog and tagged AdMob, App Best Practices, Developer Policy Center, Google Play, Policy on October 21, 2016 by Chris Jones.